One of my hobbies is retro computing. Often, when I have looked back on some of the older computing models and devices, it seems that my eyes are rose-tinted. But there are some products that can still show themselves to be superior, decades after their initial release. The IBM Model M Keyboard is among those products. Back in the 1980s, the IBM brand was synonymous with quality construction. Their personal computers were built out of thick sheet metal and industrial strength plastic. IBM's earlier PC keyboards, the Model F PC & XT (1981, 83 keys) and the Model F AT (1984, 84 keys), were also made with the same attention to quality. The Model F keyboards used buckling spring technology in its keyswitches, giving the key press an audible and tactile response. The pressure from the user required to register a key was great enough to reduce the number of unintended key presses. The keys were replaceable by lifting up from the keystem. The Model Fs do have their drawbacks. The PC Model F has a widely criticized layout. The key positioning was cramped and the US layout seemed more appropriate for Europe with its vertical Enter key and small shift keys. The PC Model F uses a different communications protocol and is not compatible with more modern AT compatible computers. The AT Model F addressed some of the PC Model F's shortcomings but still had its detractors. A short backspace key is among its most frequently cited design errors. An AT Model F will work in a modern PC (with a PS/2 adapter), but suffers from the lack of keys of a 101+ keyboard (no F11-F12, no separate cursor control or editing keys). In 1985, IBM released its Model M on the world. The layout of this keyboard has been the standard ever since for PC and even Macintosh keyboards. Unlike modern keyboards, it does not make the user suffer from tiny function keys or a small spacebar. It still uses the buckling spring technology, toned down slightly from the Model F (especially the spacebar, which I feel is too long on a Model F.) The Model M should work in just about any IBM PC Compatible except, in most cases, the original IBM PC Model 5150. Like the Model F, IBM ingrained the key symbols into the plastic. Lesser keyboards spray the symbol on top of the plastic, making the symbol likely to fade away from wear. The Model M is a heavy keyboard, it weighs approximately 5 pounds and is not likely to shift on your desk. The Model M can be used with a 5-pin DIN AT plug, a 6-pin mini-DIN PS/2 plug, or with a PS/2 Keyboard to USB adapter. I use 1390120 (no status LEDs, square IBM logo), 1390131 (status LEDs, square IBM logo) and 1391401 (status LEDs, elliptical IBM logo) style keyboards, all of which have a port on the keyboard to use an AT or PS/2 cable. The connector used is a Shielded Data Link Connector and there are SDL to USB cables available today. Because they use a converter in the USB plug, they are a bit expensive at roughly $35. The IBM Model M is easy to clean and can often be repaired. It can be opened with a 7/32" hex nut driver. Bent or worn out springs can be replaced with good tweezers. All keys can be pulled off to get at the dirt in between the key holes. One huge improvement over the Model Fs was the use of removable keycaps. Most keycaps are readily interchangeable, so with a driver and a diagram you can have your DVORAK layout. Real IBM Model M's can be purchased at the same prices as quality, high end keyboards on eBay. However, IBM subcontracted the construction of their keyboards, including the Model M, circa 1992 to Lexmark and other companies. Lexmark and its successors implemented cost cutting measures that have a small effect on the quality of their manufactured keyboards. Model M elitists generally tend to stick with true IBM made models. However, there are some late variations, like the only black Model M, the M13, that are highly sought after. A good IBM Model generally can be had on eBay for less than $75. They were very popular for businesses back in the day and there seems to be no shortage of them available second-hand. There is nothing incredibly compelling about the Model M's appearance. The keyboard is generally off-white in color with some dark keys. The key symbols are ordinary looking, as is the LED display panel. The overall look is old fashioned, but this keyboard is designed for serious work. If you must have a new Model M, a 104-key Model M or a USB-native Model M, Unicomp can sell you one. 1. Unicomp is a small outfit and has cut quality. 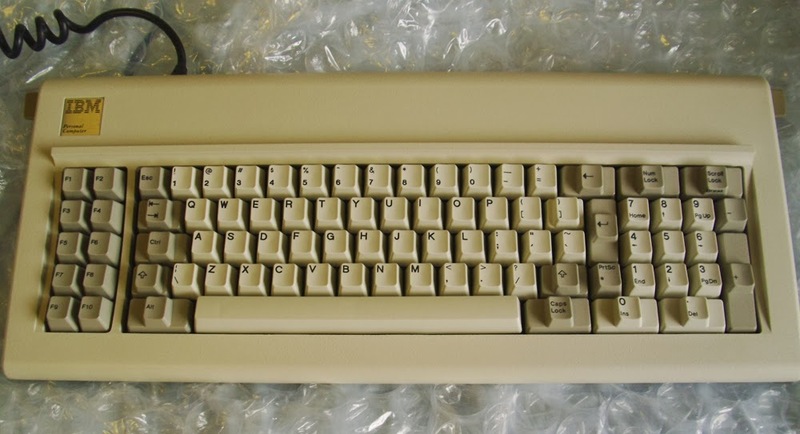 On the Unicomp keyboard I owned, compared to my IBM Model Ms, the plastic was not as weighty, the keycaps were raggedly separated, the cords were too thin. The PCB inside the keyboard was held down by a plastic tab that eventually broke off, leaving the keyboard unable to make good contact with the keyboard matrix cables. 2. 104-key keyboards are less desirable than 101 keyboards. The spacebar is drastically shortened on the 104 design to make room for windows and menu keys. The menu key is particularly useless (right click or shift+ F10). Letter-sized windows keys could have fit in between the Ctrl and Alt keys on each side of the spacebar without having to shorten the spacebar. Unicomp does offer a 103 customization that will eliminate the menu key and give the spacebar a true Model M length. The Windows keys on this mod are normal sized keys sandwiched in between the unused spaces between the Ctrl and Alt keys of a 101-key keyboard. 3. Unicomp's LED status label is ugly compared to IBM's. Gamers may prefer a more gamer friendly keyboard, the Model M can register approximately three simultaneous keystrokes. The Model M does not come with silly multimedia keys, the functions of which can generally be accomplished with a keymapper and the function keys already in place. 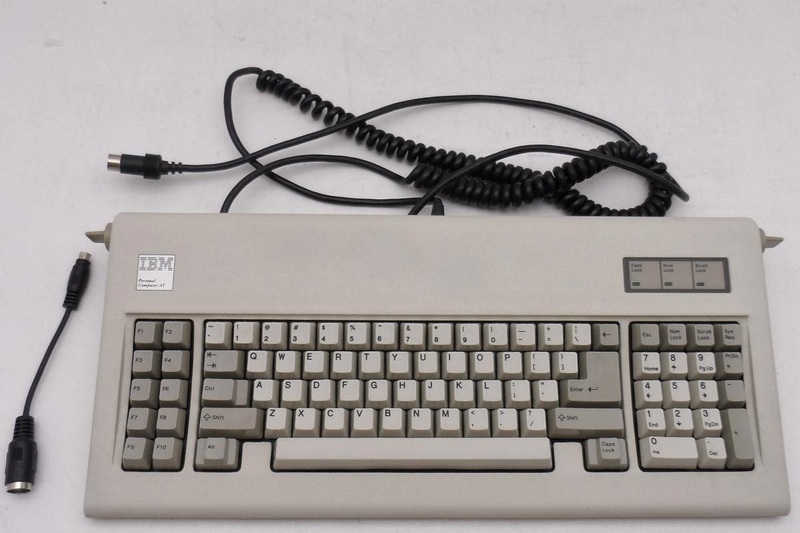 A very small desk may not be able to accommodate the length of a Model M. IBM made a space saver keyboard, 1391472, that can be very useful for people who like that style of keyboard. It does not support status LEDs. Why be cheap and use a mushy or spongy modern keyboard with rubber dome technology? A Model M, if properly taken care of, will likely outlast its owner. My occupation requires a great deal of writing, so why settle for less than the best when the best is available and affordable?